Any seafood recipe is a big favorite in our house, but shrimp seems to be the variety that is the most versatile. It’s great in stir fries or pasta dishes, delicious cooked on the BBQ and special enough for date nights. These 25 Shrimp Recipes are on the table quickly, easy enough for a busy week night but special enough for any entertaining occasion. One of the best things about cooking shrimp is that it is so darned fast to cook. Many of these dishes are ready in about 20 minutes, which makes them perfect for a day when you want something nice for dinner but just don’t have a lot of time. 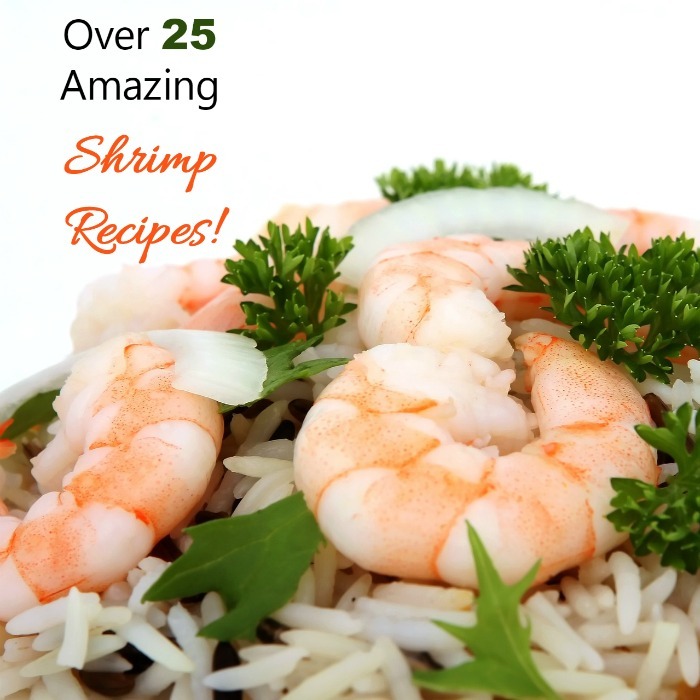 If you love shrimp recipes as much as my family does, you will want to have several great tasting recipes on hand to switch up your family’s dinner menu. 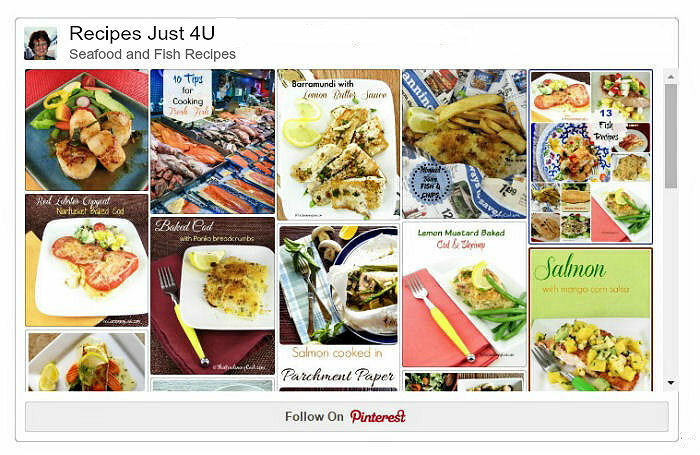 They will love the variety and you will love knowing that dinner is anything but hum drum. Cooking Tip: Hate the look of that black line on shrimp? See how to easily de-vein shrimp in this tutorial. Crunchy and sweet, these Beer Battered Shrimp have the most amazing texture. If you like a little heat with your seafood, this Spicy Shrimp and Tomato Pasta Recipe is the perfect choice for dinner. It’s time for some Tex-Mex with these delicious Grilled Shrimp Tostadas. Olé! Onto a sheet pan and into the oven go these Garlic Lemon Roasted Shrimp. What could be easier? This Easy Shrimp Alfredo with spinach and tomato recipe takes all of about 15 minutes but tastes like fine dining. Spicy Shrimp with Garlic and Parsley has a nice bit of heat that comes from red pepper flakes and paprika. This shrimp chowder recipe has the most amazing full bodied flavor. These Grilled Caribbean Shrimp Kebabs are sure to be the hit of your next outdoor party. This Oven Baked Cod and Shrimp has a tangy lemon mustard sauce. And it’s gluten free! Grilled Shrimp with a Herbed Honey Marinade – on the table in about 10 minutes and looking like a star! Shrimp Alfredo with Broccoli is my daughter’s all time favorite meal when she is home. You will love this Copycat Olive Garden Chicken and Shrimp Carbonara Recipe. It tastes like the real deal. Looking for a Middle Eastern Flair? Try these Moroccan Grilled Shrimp. Pretty up your Shrimp Florentine with some bow tie pasta. This Spicy Shrimp Recipe sits on a bed of very flavorful cabbage slaw for a refreshing summer dish. If you love Middle Eastern food, try this recipe for Tandoori Shrimp. YUMMO! Fancy smancy! Shrimp Pasta with broccoli and mushrooms. Not a 15 minute meal, but you can set it and forget it. Cook some crock pot Shrimp Jambalaya tonight. Shrimp teams up with squid, clams and scallops in this Light Seafood Piccata dish. It’s so darn pretty! Fire up the barbecue and get out the skewers. It’s time for some Shrimp Cilantro Lime Kebabs. This Skinny Shrimp Alfredo recipe has had a few tweaks to lighten it up and make it more healthy, but the flavor is still to die for! If you like meals that are easy on the clean up time, try this one pot Jambalaya recipe. Shrimp gets combined with lots of other seafood choices in this delicious light summer time seafood chowder. 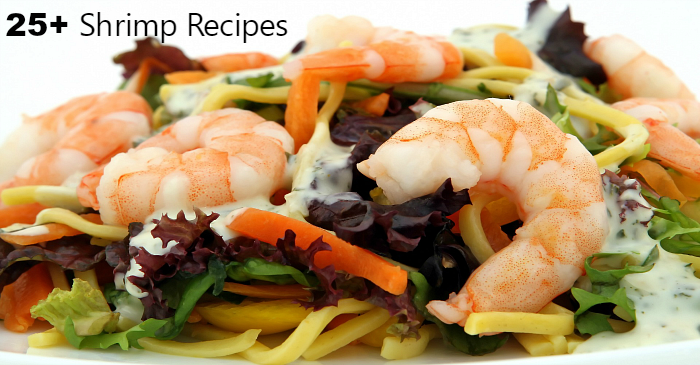 Get out your spiralizer and get ready to make this healthy Zucchini Noodles and Shrimp Stir Fry. Don’t forget the soup pot. Try this amazing Shrimp and Corn Chowder when you get a chilly night. This Shrimp Risotto recipe is the easiest of easy recipes. Yummy and crunchy with an orange dipping sauce makes for the best Coconut Shrimp ever. Dress up this Paleo Coconut Shrimp with a mango and pineapple salsa. It’s Caribbean time! If you grilling in the summertime, try these Grilled Garlic Shrimp Recipes. If you love to cook shrimp, these tools and recipe books from Amazon might interest you. 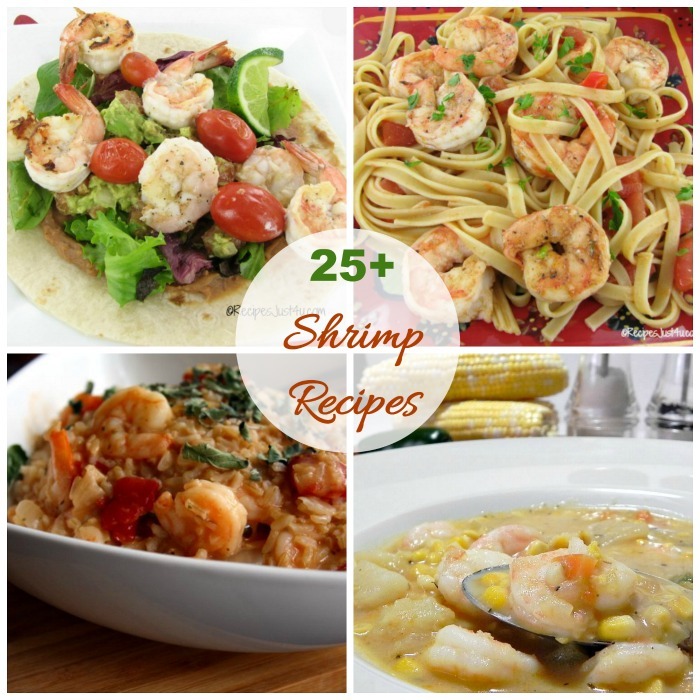 If you like this list of over 25 Shrimp Recipes, you are going to love these posts too! Over 75 Drinks and Cocktails for Every Occasion.